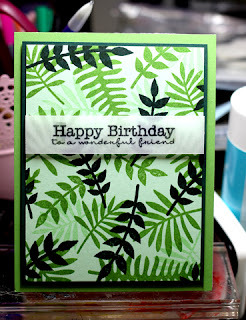 I've always meant to join in the fun of MFT Stamps Camp Create. So this session I made a point to actually follow through! Looking back, I think I would make this much simpler. I have an idea of what I would do instead, but that will have to wait for another time. 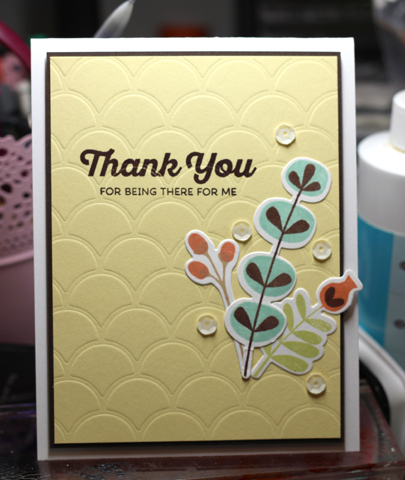 I used the leaves from the Large Desert Bouquet set. My photo is a bit shadowed, but I used all greens on there (PTI Pinefeather, New Leaf, Vintage Jadeite) I layered the leaves in different colours for my background. 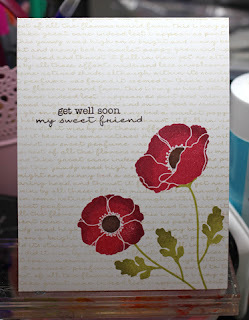 The greeting is from Pretty Poppies and is stamped on vellum since I didn't want to bring a 4th green into the mix. Next up Awesome Ombre! See, here's a card that didn't have to be monochromatic, but it ended up that way. I started by blending a few blues onto some white card stock. I cut out the hello die from that. I decided to add in some more ombre elements. 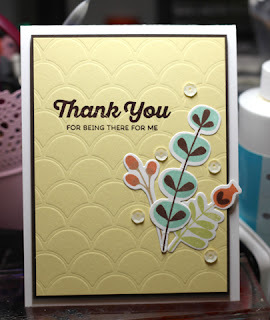 I used some of the flowers from Large Desert Bouquet and did some rock and roll stamping to achieve the blended effect. I didn't like how the hello looked onto of the flowers so I die-cut the panel and added it as an inlay. I popped that panel up since I love the look of white on white. It still seemed a touch too plain so I added a few sequins. Next up- Remarkable Resist. This was my last card of the night so I can't claim that I was feeling at my most creative. I started by stamping the stars from Count the Stars﻿ in versamark onto white cotton paper and then embossing them with white powder. 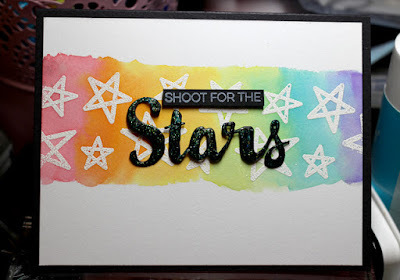 I did a quick wet wash over the stars and then used a rainbow palette of distress ink. I stamped a greeting from count the stars onto a small strip of black cardstock and paired that with a die-cut "Stars" word. I placed my watercoloured panel onto a black card base and then added some stickles to the big word since it seemed like it needed a touch of glitter! 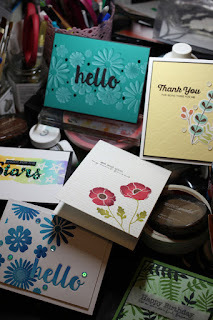 Onto the 4th challenge- Divine Dry Embossing. 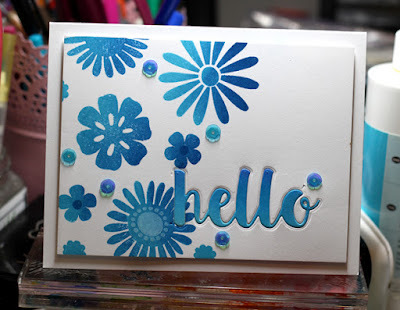 In the past, I've used stencils as embossing plates, so I thought I would give that a go with this Cascading Scallop stencil. It took a few tries to get the shims thick enough, but once it worked, it was a truly stunning effect! Now for the Bonus Bonfire Challenge- Single Layer Savvy! This was actually my second attempt. I had originally used the same poppies and watercoloured them. However, in my impatience, I stamped my greeting before waiting for my background to dry- it was blurred and unsalvageable. Given that I had about 2 more hours to try and get everything done, I decided that attempt #2 would be stamping only. I inked up the poppies using PTI's Pure Poppy and Scarlet Jewel using a roll technique to get the shading. I did a similar technique with the leaves using PTI's Simply Chartreuse and Ripe Avocado. I added my greeting using Dark Chocolate. I felt like it wasn't sharp enough for a one layer card, so I created masks for the poppies and stamped the word background in a light tea ink over the whole card. In case you were wondering, I used a copic marker to colour the poppy centres. The greeting came from the other poppy set- Delicate Pretty Poppies. 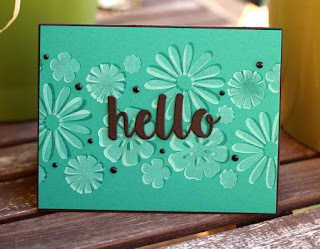 Now for the last, and maybe my favorite for the Stunning Shadow Stamping challenge. I love how easy this technique and it makes for such a sharp card! I stamped several flowers from Large Desert Bouquet in white and then again, slightly offset using PTI's tropical teal. I added the hello die, cut out from black and then added in a few black rhinestones. And here's everything on my desk amongst the mess I made! Hi Natasha! My name is Stephanie and I live in the warm and sunny state of Florida (USA). I watched your video on the Papertrey Star Search and want to congratulate you on being a finalist. Your card was beautiful! I wanted to stop by and wish you the best of luck. Oh and PS. I read back on your blog a bit and was awed by your stencil embossing. Fabulous idea! 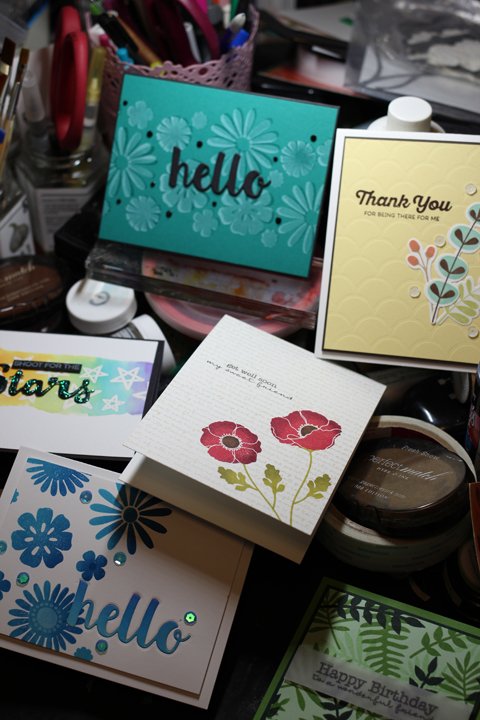 I have been stamping since 2004 and enjoy sharing my work with the stamping community.